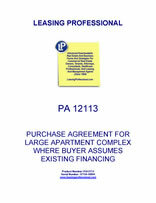 THIS PURCHASE AND SALE CONTRACT (“Contract” or “Agreement”) is entered into as of _____________, 20__ (the “Effective Date”), by and between COMMERCIAL PROPERTY SELLER, LLC , a ________ limited liability company, having an address at ____________________ (“Seller”), and COMMERCIAL PROPERTY BUYER, LLC a ________ limited liability company, having a principal address at ____________________ (“Purchaser”). A. Seller owns the real estate located in _______, _______, as more particularly described in Exhibit A attached hereto and made a part hereof, and the improvements thereon, commonly known as _______ Apartments. B. Purchaser desires to purchase, and Seller desires to sell, such land, improvements and certain associated property (“Property”), on the terms and conditions set forth below. Unless otherwise defined herein, any term with its initial letter capitalized in this Contract shall have the meaning attributed to such term herein or in Schedule 1 attached hereto and made a part hereof. 2.1 Purchase and Sale. Seller agrees to sell and convey the Property to Purchaser and Purchaser agrees to purchase the Property from Seller, all in accordance with the terms and conditions set forth in this Contract. 2.2.1 Within 2 Business Days following the Effective Date, Purchaser shall deliver to _______________________________ (“Escrow Agent” or “Title Insurer”) an initial deposit (the “Initial Deposit”) of $100,000 by wire transfer of immediately available funds (“Good Funds”). 2.2.2 On or before the day that is 2 Business Days after the Feasibility Period expires, Purchaser shall deliver to Escrow Agent an additional deposit (the “Additional Deposit”) of $100,000 by wire transfer of Good Funds. 2.2.3 At the Closing, subject to the occurrence of the Loan Assumption and Release, Purchaser shall receive a credit against the Purchase Price in the amount of the outstanding principal balance of the Note, together with all accrued but unpaid interest (if any) thereon, as of the Closing Date (the “Loan Balance”). 2.2.4 The balance of the Purchase Price for the Property, as adjusted for proration pursuant to Section 5.4 below, shall be paid to and received by Escrow Agent by wire transfer of Good Funds no later than 10:00 a.m. on the Closing Date. 2.3 Escrow Provisions Regarding Deposit. 2.3.1 Escrow Agent shall hold the Deposit and make delivery of the Deposit to the party entitled thereto under the terms of this Contract. Escrow Agent shall invest the Deposit in federally insured interest-bearing bank accounts (or such other accounts as may be approved by Purchaser and Seller) and all interest and income thereon shall become part of the Deposit and shall be remitted to the party entitled to the Deposit pursuant to this Contract. 2.3.2 Escrow Agent shall hold the Deposit until the earlier occurrence of (i) the Closing Date, at which time the Deposit shall be applied against the Purchase Price, or released to Seller pursuant to Section 10.1, or (ii) the date on which Escrow Agent shall be authorized to disburse the Deposit as set forth in Section 2.3.3. The tax identification numbers of the parties shall be furnished to Escrow Agent upon request. 2.3.3 If prior to the Closing Date either party makes a written demand upon Escrow Agent for payment of the Deposit, Escrow Agent shall give written notice to the other party of such demand. If Escrow Agent does not receive a written objection from the other party to the proposed payment within 5 Business Days after the giving of such notice, Escrow Agent is hereby authorized to make such payment. If Escrow Agent does receive such written objection within such 5-Business Day period, Escrow Agent shall continue to hold such amount until otherwise directed by written instructions from the parties to this Contract or a final judgment or arbitrator’s decision. However, Escrow Agent shall have the right at any time to deliver the Deposit and interest thereon, if any, with a court of competent jurisdiction in the state in which the Property is located. Escrow Agent shall give written notice of such deposit to Seller and Purchaser. Upon such deposit, Escrow Agent shall be relieved and discharged of all further obligations and responsibilities hereunder. Any return of the Deposit to Purchaser provided for in this Contract shall be subject to Purchaser’s obligations set forth in Section 3.5.2. 2.3.4 The parties acknowledge that Escrow Agent is acting solely as a stakeholder at their request and for their convenience, and that Escrow Agent shall not be deemed to be the agent of either of the parties for any act or omission on its part unless taken or suffered in bad faith in willful disregard of this Contract or involving gross negligence. Seller and Purchaser jointly and severally shall indemnify and hold Escrow Agent harmless from and against all costs, claims and expenses, including reasonable attorney’s fees, incurred in connection with the performance of Escrow Agent’s duties hereunder, except with respect to actions or omissions taken or suffered by Escrow Agent in bad faith, in willful disregard of this Contract or involving gross negligence on the part of the Escrow Agent. 2.3.5 The parties shall deliver to Escrow Agent an executed copy of this Contract. Escrow Agent shall execute the signature page for Escrow Agent attached hereto which shall confirm Escrow Agent’s agreement to comply with the terms of Seller’s closing instruction letter delivered at Closing and the provisions of this Section 2.3. 2.3.6 Escrow Agent, as the person responsible for closing the transaction within the meaning of Section 6045(e)(2)(A) of the Internal Revenue Code of 1986, as amended (the “Code”), shall file all necessary information, reports, returns, and statements regarding the transaction required by the Code including, but not limited to, the tax reports required pursuant to Section 6045 of the Code. Further, Escrow Agent agrees to indemnify and hold Purchaser, Seller, and their respective attorneys and brokers harmless from and against any Losses resulting from Escrow Agent’s failure to file the reports Escrow Agent is required to file pursuant to this section. 3.1 Feasibility Period. Subject to the terms of Sections 3.3 and 3.4 and the rights of Tenants under the Leases, from the Effective Date to and including the date which is 45 days after the Effective Date (the “Feasibility Period”), Purchaser, and its agents, contractors, engineers, surveyors, attorneys, and employees (collectively, “Consultants”) shall, at no cost or expense to Seller, have the right from time to time to enter onto the Property to conduct and make any and all customary studies, tests, examinations, inquiries, inspections and investigations of or concerning the Property, review the Materials and otherwise confirm any and all matters which Purchaser may reasonably desire to confirm with respect to the Property and Purchaser’s intended use thereof (collectively, the “Inspections”). 3.2 Expiration of Feasibility Period. If any of the matters in Section 3.1 or any other title or survey matters are unsatisfactory to Purchaser for any reason, or for no reason whatsoever, in Purchaser’s sole and absolute discretion, then Purchaser shall have the right to terminate this Contract by giving written notice to that effect to Seller and Escrow Agent no later than 5:00 p.m. on or before the date of expiration of the Feasibility Period. If Purchaser provides such notice, this Contract shall terminate and be of no further force and effect subject to and except for the Survival Provisions, and Escrow Agent shall return the Initial Deposit to Purchaser. If Purchaser fails to provide Seller with written notice of termination prior to the expiration of the Feasibility Period, Purchaser’s right to terminate under this Section 3.2 shall be permanently waived and this Contract shall remain in full force and effect, the Deposit shall be non-refundable, and Purchaser’s obligation to purchase the Property shall be conditional only as provided in Section 8.1. 3.3 Conduct of Investigation. Purchaser shall not permit any mechanics’ or materialmen’s liens or any other liens to attach to the Property by reason of the performance of any work or the purchase of any materials by Purchaser or any other party in connection with any Inspections conducted by or for Purchaser. Purchaser shall give reasonable advanced notice to Seller prior to any entry onto the Property and shall permit Seller to have a representative present during all Inspections conducted at the Property. Purchaser shall take all reasonable actions and implement all protections necessary to ensure that all actions taken in connection with the Inspections, and all equipment, materials and substances generated, used or brought onto the Property pose no material threat to the safety of persons, property or the environment. 3.4.1 Purchaser shall indemnify, hold harmless and, if requested by Seller (in Seller’s sole discretion), defend (with counsel approved by Seller) Seller, together with Seller’s affiliates, parent and subsidiary entities, successors, assigns, partners, managers, members, employees, officers, directors, trustees, shareholders, counsel, representatives, agents, Property Manager, and Regional Property Manager, (collectively, including Seller, “Seller’s Indemnified Parties”), from and against any and all damages, mechanics’ liens, materialmen’s liens, liabilities, penalties, interest, losses, demands, actions, causes of action, claims, costs and expenses (including reasonable attorneys’ fees, including the cost of in-house counsel and appeals) (collectively, “Losses”) arising from or related to Purchaser’s or its Consultants’ entry onto the Property and any Inspections or other acts by Purchaser or Purchaser’s Consultants with respect to the Property during the Feasibility Period or otherwise; provided, that Purchaser shall not be liable for Losses incurred by Seller resulting solely from the mere discovery by Purchaser of defects in the Property. 3.4.2 Notwithstanding anything in this Contract to the contrary, Purchaser shall not be permitted to perform any invasive tests on the Property without Seller’s prior written consent, which consent may be withheld in Seller’s sole discretion. Further, Seller shall have the right, without limitation, to disapprove any and all entries, surveys, tests (including, without limitation, a Phase II environmental study of the Property), investigations and other matters that in Seller’s reasonable judgment could result in any injury to the Property or breach of any contract, or expose Seller to any Losses or violation of applicable law, or otherwise adversely affect the Property or Seller’s interest therein. Purchaser shall use reasonable efforts to minimize disruption to Tenants in connection with Purchaser’s or its Consultants’ activities pursuant to this Section. No consent by Seller to any such activity shall be deemed to constitute a waiver by Seller or assumption of liability or risk by Seller. Purchaser hereby agrees to restore, at Purchaser’s sole cost and expense, the Property to the same condition existing immediately prior to Purchaser’s exercise of its rights pursuant to this Article III. Purchaser shall maintain and cause its third party consultants to maintain (a) casualty insurance and commercial general liability insurance with coverages of not less than $1,000,000.00 for injury or death to any one person and $3,000,000.00 for injury or death to more than one person and $1,000,000.00 with respect to property damage, and (b) worker’s compensation insurance for all of their respective employees in accordance with the law of the state in which the Property is located. Purchaser shall deliver proof of the insurance coverage required pursuant to this Section 3.4.2 to Seller (in the form of a certificate of insurance) prior to the earlier to occur of (i) to Purchaser’s or Purchaser’s Consultants’ entry onto the Property or (ii) the expiration of 5 days after the Effective Date. 3.5.1 Within 5 Business Days after the Effective Date, and to the extent the same exist and are in Seller’s possession or reasonable control (subject to Section 3.5.2), Seller agrees to make the documents set forth on Schedule 3.5 (together with any other documents or information provided by Seller or its agents to Purchaser with respect to the Property, the “Materials”) available at the Property for review and copying by Purchaser at Purchaser’s sole cost and expense. In the alternative, at Seller’s option and within the foregoing time period, Seller may deliver some or all of the Materials to Purchaser, or make the same available to Purchaser on a secure web site (Purchaser agrees that any item to be delivered by Seller under this Contract shall be deemed delivered to the extent available to Purchaser on such secured web site). To the extent that Purchaser determines that any of the Materials have not been made available or delivered to Purchaser pursuant to this Section 3.5.1, Purchaser shall notify Seller and Seller shall use commercially reasonable efforts to deliver the same to Purchaser within 5 Business Days after such notification is received by Seller; provided, however, that under no circumstances will the Feasibility Period be extended and Purchaser’s sole remedy will be to terminate this Contract pursuant to Section 3.2. 3.5.2 In providing the Materials to Purchaser, other than Seller’s Representations, Seller makes no representation or warranty, express, written, oral, statutory, or implied, and all such representations and warranties are hereby expressly excluded and disclaimed. All Materials are provided for informational purposes only and, together with all Third-Party Reports, shall be returned by Purchaser to Seller (or the destruction thereof shall be certified in writing by Purchaser to Seller) if this Contract is terminated for any reason. Recognizing that the Materials delivered or made available by Seller pursuant to this Contract may not be complete or constitute all of such documents which are in Seller’s possession or control, but are those that are readily and reasonably available to Seller, Purchaser shall not in any way be entitled to rely upon the completeness or accuracy of the Materials and will instead in all instances rely exclusively on its own Inspections, and Consultants with respect to all matters which it deems relevant to its decision to acquire, own and operate the Property. 3.5.3 In addition to the items set forth on Schedule 3.5, no later than 5 Business Days after the Effective Date, Seller shall deliver to Purchaser (or otherwise make available to Purchaser as provided under Section 3.5.1) the most recent rent roll for the Property, which rent roll is that which Seller uses in the ordinary course of operating the Property (the “Rent Roll”) together with, to the extent available, copies of rent rolls for the three (3) calendar months prior to the Effective Date. Seller makes no representations or warranties regarding the Rent Roll other than the express representation set forth in Section 6.1.5. 3.5.4 In addition to the items set forth on Schedule 3.5, no later than 5 Business Days after the Effective Date, Seller shall deliver to Purchaser (or otherwise make available to Purchaser as provided under Section 3.5.1) a list of all current Property Contracts (the “Property Contracts List”). Seller makes no representations or warranties regarding the Property Contracts List other than the express representations set forth in Section 6.1.6. 3.6 Property Contracts. On or before 10 days after the Effective Date, Purchaser may deliver written notice to Seller (the “Property Contracts Notice”) specifying (i) any Property Contracts which Purchaser desires to terminate at the Closing (the “Terminated Contracts”) and those Terminated Contracts for which Purchaser wants Seller to pay any applicable penalty, premium, or damages, including liquidated damages, for cancellation (the “Termination Fees”) and (ii) those Property Contracts not being terminated for which Purchaser wants Seller to obtain a consent of the vendor to the assignment. On or before 10 days after Seller’s receipt of the Property Contracts Notice, Seller may, in Seller’s sole discretion, give Purchaser notice of those Termination Fees and those Vendor Assignment Consents which Seller is willing to pay/obtain and the additional conditions, if any, that Seller requires in order to do so. If Purchaser is dissatisfied with the Seller’s response or if Seller fails to provide a response, Purchaser may, as its sole remedy, exercise its right to terminate this Contract prior to the expiration of the Feasibility Period in accordance with the provisions of Section 3.2. If Purchaser fails to timely exercise such right, Purchaser shall be deemed to accept the terms of Seller’s response and without any reduction or abatement of the Purchase Price.